We looked at the top 7 Gas Pressure Washers and dug through the reviews from 84 of the most popular review sites including BestReviews, Consumer Reports, Ope Reviews, Family Handyman, Popular Mechanics, New York Times Wirecutter and more. The result is a ranking of the best Gas Pressure Washers. Our experts reviewed the top 7 Gas Pressure Washers and also dug through the reviews from 84 of the most popular review sites including BestReviews, Consumer Reports, Ope Reviews, Family Handyman, Popular Mechanics, New York Times Wirecutter and more. The result is a ranking of the best of the best Gas Pressure Washers. The Ryobi 3000 PSI is powerful, easy to maneuver (it even goes up stairs without hassle) and user-friendly. It also has a powerful Honda engine. DWYM Outdoor and Garden Experts plus Consumer Reports, New York Times Wirecutter, The Spruce, Popular Mechanics, Pro Tool Reviews, Family Handyman and 2 more. Along with user reviews from Home Depot.
" Easy to operate its controls, very easy to move and transport, and to store it." "It’s heavier, it’s louder, and it needs fuel, maintenance, and proper storage in the off-season." The Generac OneWash 3100 is not only super easy to use, but it's extremely powerful. A unique feature is that it lets you easily adjust the pressure. DWYM Outdoor and Garden Experts plus Consumer Reports, Popular Mechanics, Family Handyman and 3 more. Along with user reviews from Amazon and Home Depot.
" Especially effective at cleaning and very effective at removing stains." The Simpson Megashot 3100 PSI is made out of steel, which makes it super solid. It also scored high due to its portability and its power. DWYM Outdoor and Garden Experts plus BestReviews, Consumer Reports, New York Times Wirecutter, The Spruce, Family Handyman and 7 more. Along with user reviews from Home Depot.
" Powerful enough for heavy-duty cleaning jobs. Solid, durable construction." "On-off switch not easy to read and use." 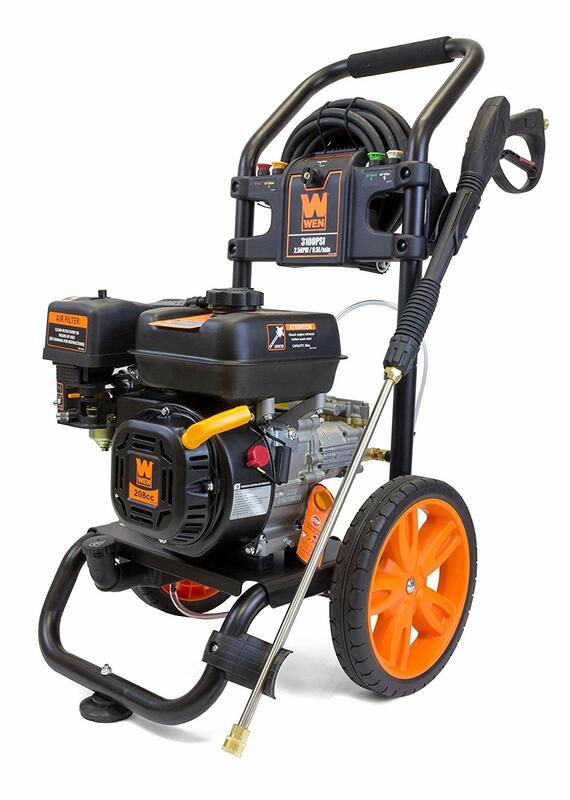 This durable Wen 3100 PSI model offers the best value among gas pressure washers. Its large wheels also make it easy to transport across all types of terrain. DWYM Outdoor and Garden Experts plus BestReviews and 3 more. Along with user reviews from Amazon and Home Depot.
" Large, never-flat wheels for all-terrain maneuverability." We identified the majority of the gas pressure washers available to purchase. Reviews from our DWYM category experts and analysis of some of the most respected sources including: BestReviews, Consumer Reports, Ope Reviews, Family Handyman, Popular Mechanics. We also incorporate user reviews from the leading retailers including Amazon, Home Depot. Easy to operate its controls, very easy to move and transport, and to store it. This gas-powered Ryobi lets you wash things you can’t reach with an extension cord, and it cleans twice as fast as an electric model. Though branded a Ryobi, it’s powered by a Honda GCV160 engine. While not all Pros really consider Ryobi when looking for a pressure washer, it’s the Honda engine that gives me the confidence to pull the trigger. The unit has some very nice features starting with an idle down feature which idles the unit down when in standby mode and helps save gas and also makes the unit quieter when idling. Like the Simpson, this machine impressed us enough to win our Best Overall award. Its hose is our favorite by far. It’s heavier, it’s louder, and it needs fuel, maintenance, and proper storage in the off-season. Lightweight is relative, of course, since the unit still weighs 62 pounds. But either one of us can manhandle it in or out of a truck with relative ease. Not that I have any complaints about this unit, but if I did I would really like to see a 50′ hose. Our only beef is that the pump connections are right at ground level. Large, never-flat wheels for all-terrain maneuverability. It’s more for recreational use than commercial use, but the pump in the pressure washer is very durable, which many argue is more important than the actual engine. Some reports of lost pressure and engine issues after several weeks or months of ownership. As a homeowner, you likely take great pride in the curb appeal of your home – no matter whether you’ve owned your house for just a few months or for many years. After all, it’s your castle, the place where you and your family spend the majority of your time outside of work and school. If you really want to make the exterior of your home sparkle, you’ve likely considered investing in a gas pressure washer to keep it spotless. From your driveway to your siding (and lots of places in between), a gas pressure washer can quickly and easily rinse away years of build-up and grime. A gas pressure washer is one that uses gas instead of electricity for power. Since you don’t have to plug your gas pressure washer into an outlet, you can easily transport it anywhere you need to blast some dirt away — there’s no hassle of getting out an extension cord or trying to stay near an outlet. Gas pressure washers won’t cause your electricity bill to spike, either. You’ll simply refill your gas pressure washer with gas from a gas pump, much like you would a gas lawn mower. They’re also extremely easy to use, once you’ve read through the instruction manual and got the hang of things. You’ll be powering through stubborn dirt on your fence, your gutters, your windows and other areas of your home or business in no time. To fully understand the awesome power (and danger) a gas pressure washer produces, it’s helpful to compare it to your standard garden hose. Case in point: the water pressure of your garden hose is somewhere in the neighborhood of about 50 pounds of pressure per square inch. Your gas pressure washer? Believe it or not, it’s closer to 1,000 to 4,000 pounds of pressure per square inch, which is a huge difference. That’s also why it’s super important to follow all the safety protocols in the user manual so that no one gets hurt. Always keep an eye on children when you own a pressure washer, even if you think it’s store out of sight — you can never be too careful when it comes to that much pressure. Regular maintenance is critical for keeping your gas pressure washer working like new. You’ll want to follow all of the maintenance and cleaning processes listed in the user manual to ensure that your gas pressure washer has a long life without issues. If you’re just getting started with your new gas pressure washer, consider testing it on a small, hidden patch of whatever surface you’re trying to clean. It can take a few tries to really get the hang of pressure washing, so this will give you a place to practice until you’re confident in your abilities. There’s a difference in power among gas pressure washer models. Typically, you can separate them into broad categories: light-duty, medium-duty and heavy-duty. The power of a gas pressure washer will be labeled in pounds per square inch, typically written as “PSI.” In essence, this number tells you about your pressure washer’s ability to blast or strip dirt off of a surface. In general, light-duty pressure washers have a PSI of up to 1900 and are good for light jobs around the house, like washing your car. A medium-duty pressure washer might have a PSI between 2000 and 2800, whereas a heavy-duty model typically has a PSI above 2800. The Ryobi 3000 PSI, for example, is incredibly powerful, thanks to its Honda GCV160 engine. Some models, such as the Generac OneWash 3100 PSI, allow you to adjust the pressure for varying jobs. Another important metric to know before purchasing a gas pressure washer is its volume, which is labeled in gallons per minute, or “GPM.” This number is just as important as the pressure, as you need the flow of water to move the dirt and grime away from the surface you’re cleaning. With the Simpson MegaShot 3200 PSI model, for example, you’ll get 2.5 gallons per minute for volume. Consider how important accessories are before purchasing a gas pressure washer. The Simpson MegaShot 3200, for instance, comes with five different nozzle tips that you can connect to its steel spray wand, which means it can easily switch between cleaning your RV, your driveway or your home’s siding. If you’re looking to save a little bit of money, the WEN 3100 PSI offers the best value with a price below $300. Other models generally range in price between $300 and $400. For the Gas Pressure Washer category, we analyzed 84 of the most popular reviews including reviews from BestReviews, Consumer Reports, Ope Reviews, Family Handyman, Popular Mechanics, New York Times Wirecutter and more. The result is a ranking of the best Gas Pressure Washers.